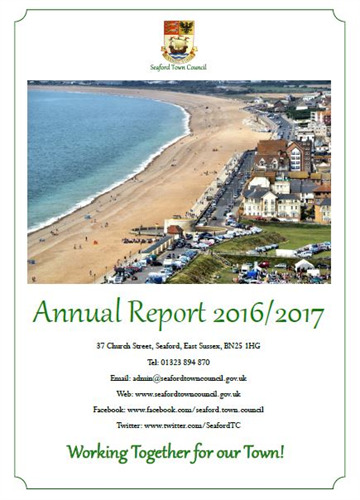 Seaford Town Council has published its Annual Report for the 2016-2017 Municipal Year, filled with updates and news from the Council. The Report can be found on the Annual Report page or hard copies can be found in the Tourist Information Centre at 37 Church Street. The Report sets out the Mission Statement and Strategic Objectives that were adopted by the Council in 2016, the progress against these and achievements made, as well as giving an insight in to the aims for the coming year to May 2018. A financial overview is included looking at the budgeting process and Council Tax levels, the expenditure throughout the year and performance against budget, the financial grants awarded by the Council to community groups and the internal audit process and findings. Please contact the Council with any questions regarding the Report, the content or Council activities; Councillors and staff alike are always at hand to help.